US Congress – Fully Packed, 26 Standing Ovations. 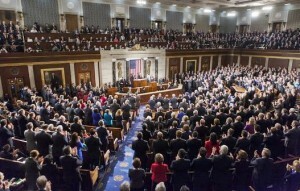 Washington, D.C. — March 3 … Communicated by the Prime Minister’s Office to the Israel News Agency. Today the Jewish people face another attempt by yet another Persian potentate to destroy us. Iran’s Supreme Leader Ayatollah Khamenei spews the oldest hatred, the oldest hatred of anti-Semitism with the newest technology. He tweets that Israel must be annihilated – he tweets. You know, in Iran, there isn’t exactly free Internet. But he tweets in English that Israel must be destroyed. The difference is that ISIS is armed with butcher knives, captured weapons and YouTube, whereas Iran could soon be armed with intercontinental ballistic missiles and nuclear bombs. We must always remember – I’ll say it one more time – the greatest dangers facing our world is the marriage of militant Islam with nuclear weapons. To defeat ISIS and let Iran get nuclear weapons would be to win the battle, but lose the war. We can’t let that happen. I have absolutely NO respect for this wench of a so called President Obama..The epitome of trash. I have never and will never consider him president. But for Benjamin Netanyahu now that’s a different story. This man is a leader! One of the very best in my lifetime ! What an absolute honor to see him in Congress ! I wished we had a leader steadfast and true as Bibi!